Fairfield firefighters successfully rescued Wednesday a man who had fallen from an upper roof of a Mill Hill Road home onto a lower section of the home. The man apparently fractured his right leg. 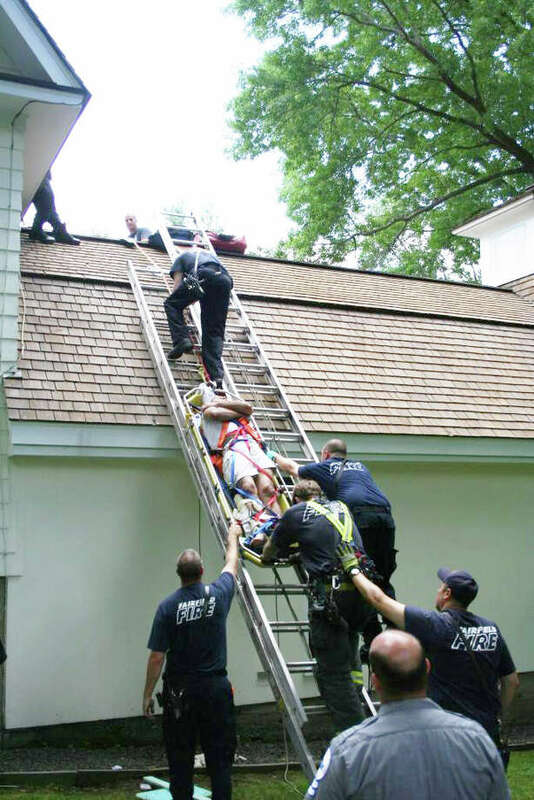 A worker at a Mill Hill Road home had to be rescued by Fairfield firefighters Wednesday morning after a fall from the upper part of the roof to a lower section left him with a serious leg injury. The 41-year-old man, strapped onto a backboard, was lowered to safety down a ladder, according to fire officials. He was unable to move on his own, firefighters said, after apparently fracturing his right leg. Once the injured worker was lowered to the ground, an AMR ambulance transported him to St. Vincent's Medical Center in Bridgeport for treatment. Incident commander Stephen Curry, an assistant chief, said it was a "challenging rescue." He cited a recent departmental training program in rope rescue, held at Samp Mortar Reservoir earlier this year, as "very instrumental" in rescuing the man with minimal distress to his injuries. Fire officials, who received the first call about the accident 11:22 a.m., cleared the scene within 50 minutes.